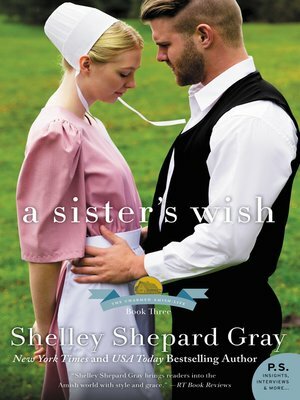 In Shelley Shepard Gray's third book in her Charmed Amish Life series, a respectable young woman finds herself falling for an Amish man from the wrong side of the tracks. Amelia Kinsinger is the perfect Amish woman—at least according to her neighbors. And while Amelia takes pride in her role as homemaker, she's also harboring a secret: She's been in love with bad boy Simon Hochstetler for as long as she can remember. Too bad he's about as far from "perfect" as an Amish man could get... but that's exactly why she's so drawn to him. Life hasn't been kind to Simon. He ran away from an abusive home at fifteen and things went downhill from there. Eventually, Simon landed in prison. But the experience changed him. Now back in Charm as a grown man, he's determined to make a new life for himself and not think too much about his wild past...unless it pertains to Amelia. He's loved Amelia for years. To him, she represents everything good and kind in the world. When he realizes that she returns his affections, he starts calling on her in secret, even though her older brother Lukas—who just happens to be Simon's best friend—has made it perfectly clear that Amelia deserves better. Simon disagrees and believes he's the only one who can truly make her happy. But when Amelia gets hurt, it sets off a chain of events that forces them to consider their future together—and face their past mistakes. There's a chance for love... but only if Simon dares to trust Amelia with the secrets of his past.